Kate Shugak is an Aleut who lives on a 160-acre homestead in a generic national Park in Alaska. And here is a brand new (as of January 17, 2013) map for you, courtesy of the genius of Dr. Cherie Northon, cartographer extraordinaire of Mapping Solutions. Click on the map to embiggenate. Kate’s roommate is a half-wolf, half-husky dog named Mutt. Her nearest neighbors are a bull moose and a grizzly sow. 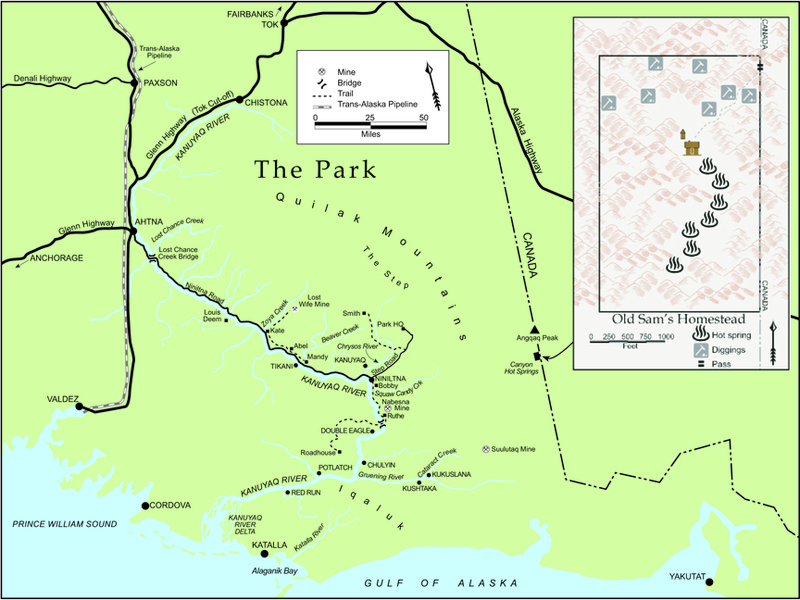 Farther off are dog mushers, miners, hunters, trappers, fishermen, bush pilots, pipeline workers, Park rats and Park rangers, other Aleuts, Athabascans, a few Tlingits and the residents of Niniltna, a village perched on the edge of the Kanuyaq River, a 600-mile long, salmon-rich tributary that winds through the Park to Prince William Sound.